Healthcare workers agree that the best medicine for a sick child is to have mom and dad by their side. The Ronald McDonald House lets parents get a restful night's sleep, yet be just minutes from the hospital if they need to return to their child. RMHC of Greater Las Vegas relies on generous donors like you to support families when their child is in a Las Vegas hospital. If you wish to pay by mail, please make your check payable to RMHC of Greater Las Vegas mail it to 2323 Potosi St, Las Vegas, NV 89146. 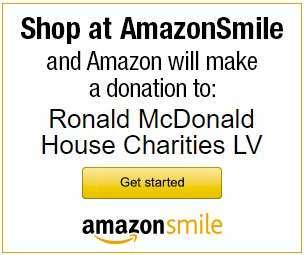 All funds raised for RMHC of Greater Las Vegas remain in our community. Healthcare workers agree that the best medicine for a sick child is to have mom and dad by their side. The Ronald McDonald House® lets parents get a restful night's sleep, yet be just minutes from the hospital if they need to return to their child. RMHC® of Greater Las Vegas relies on generous donors like you to support families when their child is in a Las Vegas hospital. You can donate online now or download and print our mail-in form. Many McDonald's restaurants have RMHC® Donation Boxes displayed by cash registers and drive-thru windows. For more information, please visit our donation boxes page. By signing up for the Smith's Inspiring Donations® Program, Smith's will donate back to your selected charity each grocery store trip you make at no cost to you! Learn how to sign up here. Whether it's through monetary gifts, in-kind donations or volunteering, our corporate sponsors have been a vital part of helping us deliver comfort and care to children and their families. Partnering with Ronald McDonald House Charities® will have a positive influence on your customers and employees. Learn more about corporate donations here. The little, seemingly insignificant tab you pull to open your aluminum cans is like gold to the Ronald McDonald House®. We collect these pop tabs, recycle them, and the proceeds go directly to Ronald McDonald House® families. Learn more about collecting pop tabs here. Recycle Ink Cartridges and Old Technology Donations of used ink cartridges, cell phones, digital cameras, GPS devices, iPods and laptops not only earn money for our organization but keeps our environment clean. Please drop off your items at the Ronald McDonald House® (2323 Potosi St | Las Vegas, NV 89146) for us to recycle and raise funds. Learn more about technology donations here. Donations can be made in acknowledgement of a special person, to commemorate a birthday or anniversary, or in memory of an individual who has passed. Notification is sent to the individual(s) or family who is being recognized, as well as the donor. You can donate online or download and print our mail-in form. RMHC® of Greater Las Vegas is a 501(c) (3) tax exempt organization, IRS Section 170(b) (2) (iii) for both federal and state tax purposes under tax ID# 94-3108570. Contributions to RMHC® of Greater Las Vegas may be tax-deductible to the fullest extent allowable by law. All donors will receive a signed thank you letter via postal mail to be used as a receipt for tax purposes. If you have additional questions in regard to your tax deductible donation, please consult with your tax advisor. Donate your car, truck, SUV, boat, RV or off-road vehicle to the Ronald McDonald House Charities® of Greater Las Vegas’ car donation program. Making a car donation is quick and simple! Learn more about donating a vehicle here.